Donkey Kong Jr. has to collect the key on the bottom screen by climbing vines and dodging Snapjaws and Sparks. 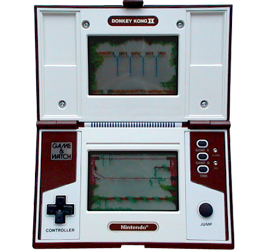 Once collected, the key is passed to the top screen and Junior has to climb the chains while dodging Birds to unlock one of Donkey Kong's chains. Clear the stage four times to free Donkey Kong. Jumping over a Snapjaw or Spark scores 1 point. When you unlock one of the chains holding Donkey Kong, you are awarded 5-15 points depending on how long it took you. When all four locks are opened you score 20 points. If you have no misses when you reach 300 points then Chance Time begins and all points are doubled until you get a miss. After placing keys in the locks, most Birds and Snapjaws will disappear (Snapjaws in the bottom-right and Birds in the top-left will remain on screen). After placing keys in the locks, all Birds and Snapjaws remain on screen.